I’ve often fantasized about making this Comforting Chicken and Shittake Mushroom Stew whenever I craved for a simple meal with lots of gravy . 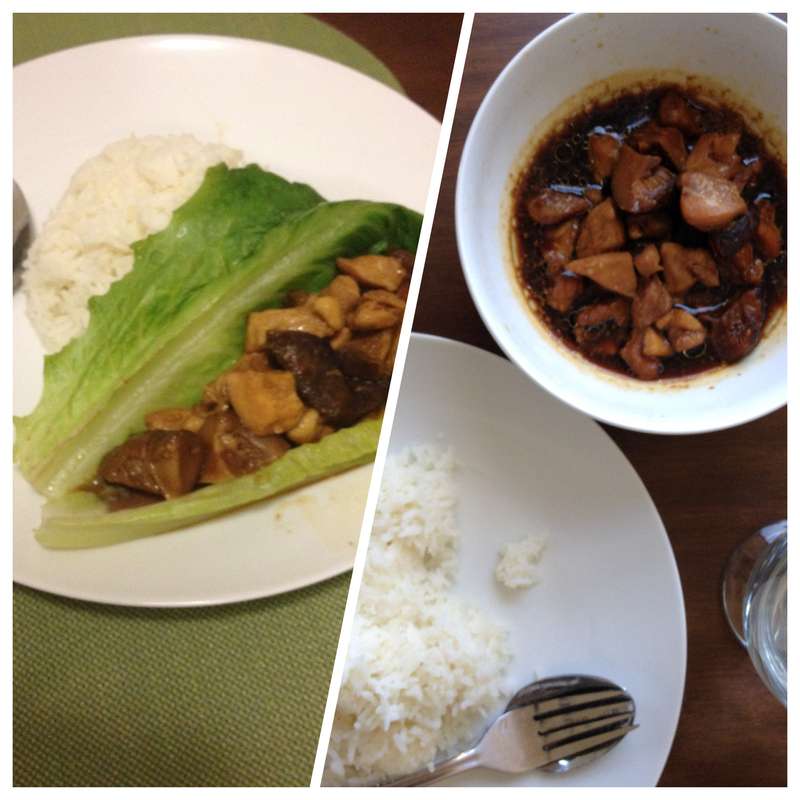 Finally I cooked this dish in an attempt to make the a nice meal for W last week when he was ill with a bad cold. The stew turned out to be right up our taste alley. It was even better the next day for lunch – loved the mushrooms. A little on the oily side (I wasn’t as thorough in trimming the chicken fat as I could have been), but very satisfying with Thai white rice. I’ve approximated the measurements here but I’m afraid my recipe is not tried and tested at all. Still, wanted to share. 0. Soak Shittake mushrooms in warm water. This is done preferably a few hours before cooking but if in a rush, use boiling water and half an hour should do it. Slice each mushroom into 4 wedge pieces. 1. Chop chicken thighs into bite-sized pieces, removing excess skin and fat. Marinate with salt. 2. Heat wok on low-medium heat. Add oil. 3. When oil is hot, stir-fry garlic and ginger until fragrant. 4. Add chicken to wok, stir-fry. 5. When chicken is slightly browned on outside (not completely cooked inside though), add mushrooms. 6. Mix mushrooms and chicken. 7. Mix ingredients for the sauce in bowl. Add to wok. 8. Cover wok with lid. Once mixture has come to a boil, turn heat down to low so that it is just simmering. 9. Let simmer on low heat for at least half an hour. 10. Make sure that there is enough liquid to just barely cover the protein. Add water 1 tablespoon at a time if necessary. 11. Taste stew and add salt to taste. When making this last week, I added a few large Romaine lettuce leaves to the wok to steam them for 2 minutes before switching off the heat. I then ladled the stew on top of the lettuce. It was an easy way of getting some green in our meal without having to prepare a side. In my college days, I used to make a version of this with small chunks of potato – also yummy but the starch in the potato would make the sauce very thick. I refer this version for its relative simplicity. 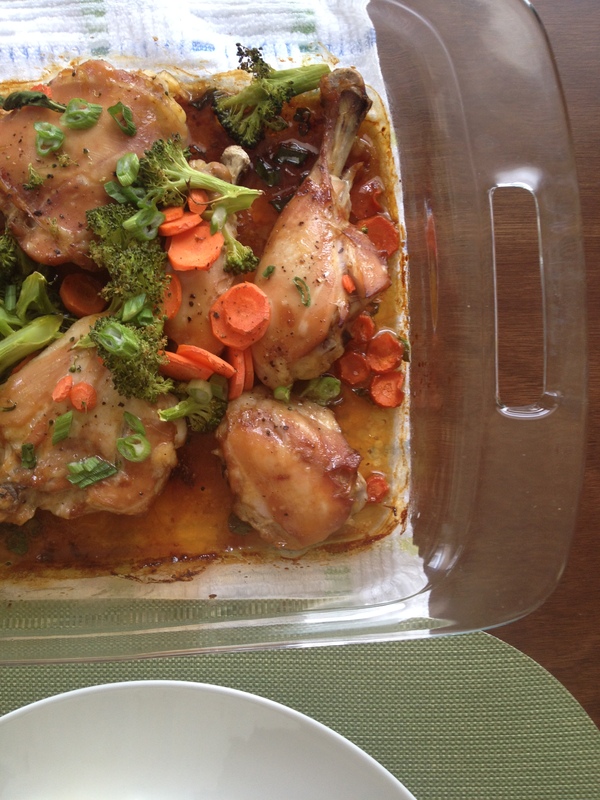 I like this dish for its simplicity – protein and veggies, cooked in an oven, no fuss whatsoever! I adapted the recipe from here. Didn’t get quite the same level of caramelization because I scaled back on the soy sauce and sugar, and added small broccoli florets and thin carrot coins into the mix. The marinade featured in the recipe is pretty good, and I love the idea of marinating the chicken in the fridge for at least a couple of hours to really infuse the meat with flavour. Personally I think the baking then broiling steps are bit of overkill – I just kept baking at a steady temperature. My dish came out a little dry, probably needed a bit more sauce and perhaps to cover the glass dish for the first 20 minutes or so. I realize that this post and the last featured recipes from other people (gasp) but I promise the next few are going to be original creations ;), so stay tuned. This is my recipe for Asian-style baked chicken wings, which I turn to when I’m not in the mood to do any stovetop cooking. It’s certainly one of the easier recipes on this blog: less than 10 ingredients and minimal cooking involved ;). The key ingredient for these chicken wings is lime juice. Although limes are probably one of the more expensive fruits out there, I’ve found that they are often an irreplaceable ingredient in certain dishes — lemon doesn’t always cut it! 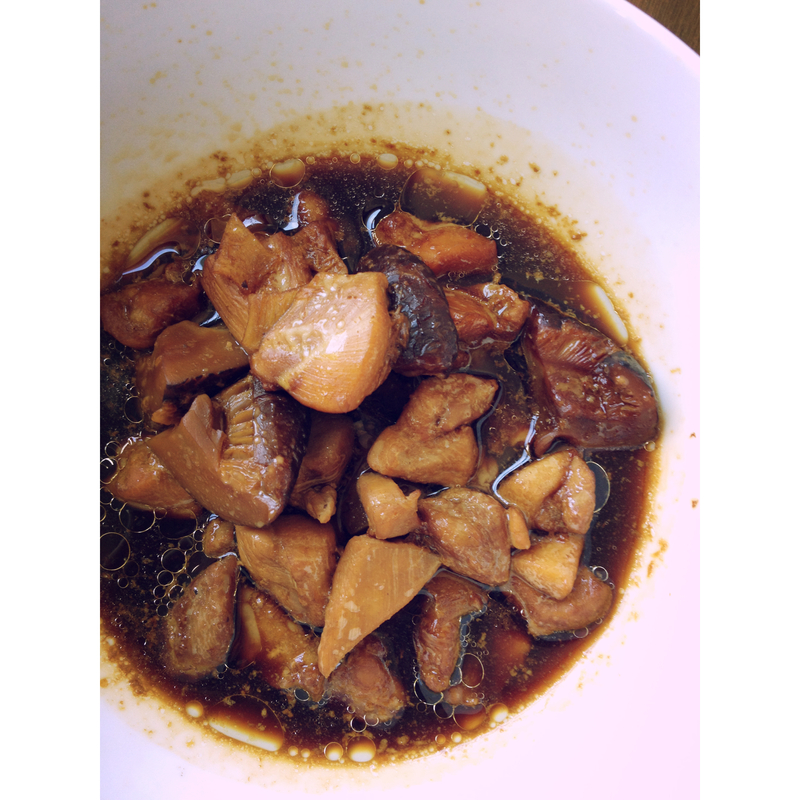 Lime juice in the sauce keeps the chicken moist, and the fruit’s tart, refreshing sweetness goes really well against the heavier saltiness of the soy sauce. It’s become a little luxury I go out of my way to get for myself. Some young women like shoes; I like juicy green limes. Priorities! One thing to note about the method is that the overall baking time will vary with the oven type and number of chicken wings used. I’ve listed approximate times here, which have worked well with my fan assisted oven. When drizzling the honey (another crucial ingredient that will make the chicken taste absolutely divine!) over the wings in the last 3-5 minutes, do stay by the oven and make sure the sugar does not burn. You want a nice caramelised sheen over the chicken, not black charred bits! 0. Pre-heat oven to 200 degrees Celsius. 1. Clean chicken wings under cold water and make sure they are de-feathered properly. Pluck any stray feathers. 2. Pat dry with kitchen roll. 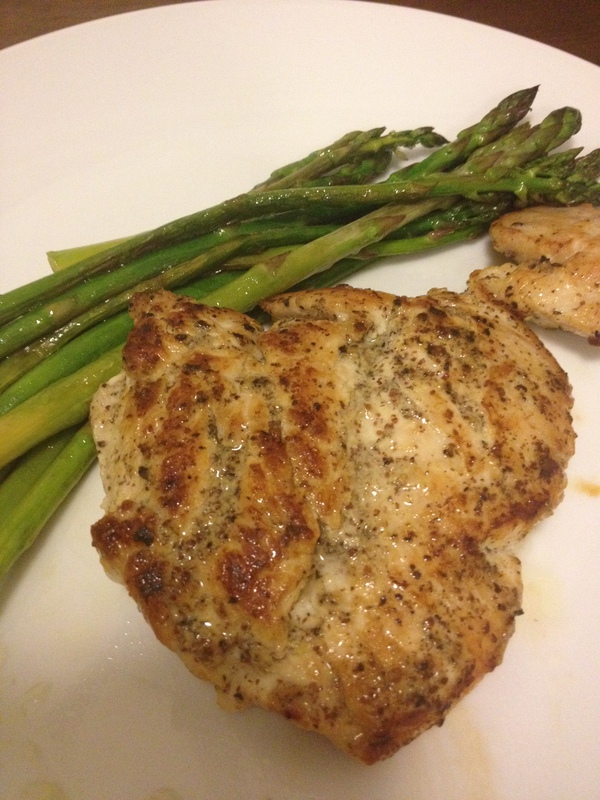 In a large bowl, marinate chicken generously with salt and black pepper. After salt and black pepper, marinate with vegetable oil (1 tablespoons should do it). Leave to marinate for at least half an hour. You may want to put the chicken in the fridge; my kitchen is generally cool so I let it sit on the counter-top. 3. Line a large baking tray with aluminium foil drizzled with a little vegetable oil. Arrange wings skin-up on tray when chicken and oven are ready. 4. Mix together soy sauce, lime juice and rice wine together in a bowl. Pour 4/5 of the mixture over wings. – At 15-20 minutes, baste wings with remaining 1/5 of the sauce, and spoon over any juices that have accumulated in the baking tray. – At 25-30 minutes, flip each wing with chopsticks (or tongs, if less adept with chopsticks!) so that the underside is facing up. – At 40-45 minutes, flip each wing back so the skin is facing up. Drizzle honey across the wings. Bake for remaining 3-5 minutes until wings are golden brown — watch the wings carefully as honey can burn very quickly. 6. Serve wings with salad – cucumbers would go well.